Action feature: With Attack Jaws & Ultra-Defense Neck Spikes. Behavior: InGen's effort to create a ferocious carnivore with the size of a brachiosaur resulted in the massive Amargospinus. Standing over 40 feet tall, its long neck and tail provied a wide attack radius for its razor-sharp jaws, while its spiny back and slashing neck spikes offer a near-impenetrable defense. The Amargospinus is a loner by nature and second only to the Ultimasaurus for individual ferocity. Description: this four legged spiky creature stands in a fairly neutral posture, though its left front leg seems to be taking a step forward, and its head is raised upwards somewhat, like it’s looking at something above it. Amargospinus looks like a small Sauropod type animal, but it’s got two spikes on each side of the neck and a pair of frills running from the back of the head to the shoulders. It also features a row of frills on its back running to about halfway the tail, starting with three separate blade like spikes. Pulling the right hind leg back makes the spikes on its back and the sides of the neck raise upward and the mouth open, clearly establishing an aggressive action. This beast sports a fiery, demonic paint job through a combination of black, yellow and red colours. The creature’s underside (belly, lower part of the tail) as well as the sides and back of the neck are painted yellow, though its throat and lower jaw are red. The snout is red as well, apart from a black spot on the very front. A large red spot in a flaming pattern is found on the back with the moveable spikes sticking out of it. These spikes, as well as those on the tail and back of the neck, are black with red skin between them. The spikes on the sides of the neck are totally red by comparison. Amargospinus has small white eyes (no pupils) and teeth. The rest of this animal’s paint job (flanks, tail, head, legs and parts of the neck) is black. Its claws are not painted. On the right hind leg a yellow JP Chaos Effect logo is found, baring the number .58. This creature does not come with any pieces of capture gear. Analysis: this is an interesting addition to the Chaos Effect line, for various reasons. 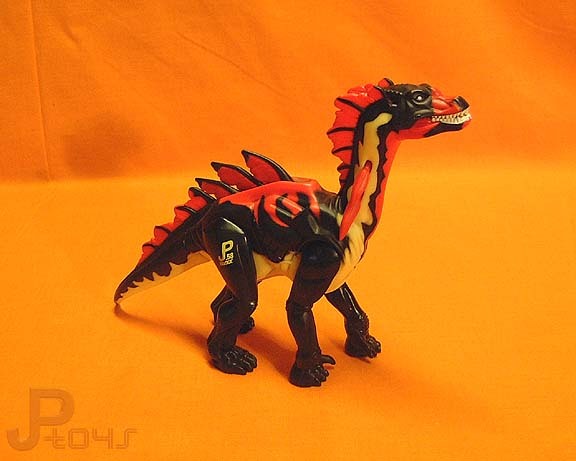 It features an appealing and neat paint job, reminiscent of flames and fire, indicating either an aggressive nature or faking aggression for defensive purposes. It’s definitely one of the cooler paint jobs in the Chaos Effect toy line. The attack action, if it can be called that, is fun, but it doesn’t really do anything to any potential aggressors. It seems more like a defence method, making this creature look meaner and more ferocious when the spikes are shown in full glory. Any enemies would think twice before bothering Amargospinus with nasty protrusions like these. Though it doesn’t inflict damage to other figures, limbs or other body parts can still get caught between them, possibly leading to involuntary amputations of sorts. The mouth, which is also opened by pulling the right hind leg back, unfortunately isn’t strong or big enough to clamp figures between the jaws, but at least it gives the sense this monster is roaring to its attackers. 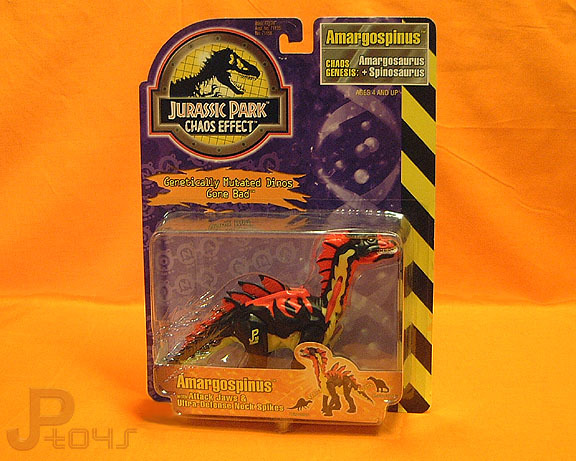 Though Amargospinus is a nonexistent species of dinosaur, made up for this toy line, it’s the first non hatchling Sauropod creature of any of the JP toy lines (and would stay that, until the JP III Brachiosaurus figure came along). 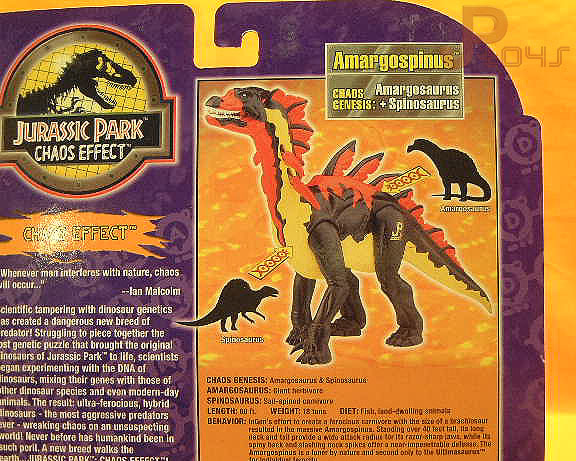 Unfortunately it isn’t very big, though the background story on the back of the card would have us believe Amargospinus was the biggest Chaos Effect hybrid creature. We can assume this sculpt is a juvenile, but it’s a shame a large Amargospinus (or any real Sauropod for that matter) was denied to the JP toy fans. 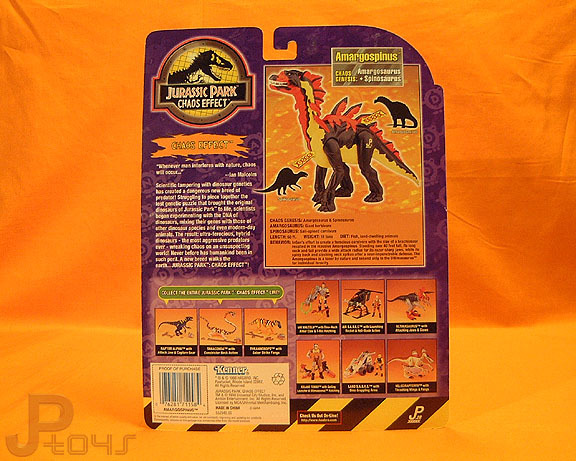 Additionally, judging from the small teeth Amargospinus might be a herbivore (the only one in the Chaos Effect line), in which case retractable spikes would seem like a useful defence mechanisms against any one of the nasty carnivorous critters this toy line consisted of. Playability: not really great. Though the legs can be posed in different positions, the creature looks best walking on all fours. It can be balanced on its front legs with the hind legs in the air though, for your information, making it look like a circus animal. The spike system works fine and looks cool, but since it doesn’t do much else, it only adds limited playability options. The tail might look poseable, being a separately attached component, but it unfortunately isn’t. This figure does not come with any accessories that might have increased playability options. Realism: there’s a lot of Amargasaurus in this sculpt, but not all that much Spinosaurus. Since Amargasaurus already was a bizarre Sauropod with frills running from its neck to its back, all the genetic mixing with Spino DNA seems to have caused is adding a more ferocious and aggressive look to it, as well as giving it a retractable spikes for defensive action (it seems unlikely Amargasaurus used those frills for similar purposes in real life). As mentioned above, Amargospinus is supposed to be the biggest Chaos Effect creature, but the size of this figure doesn’t live up to that. In truth, Amargasaurus was actually a rather small type of Sauropod, since it only grew to a length of about 10 metres (which is small by Sauropod standards). Spinosaurus could grow as big as 15 metres in length however. This too hints at this figure representing a juvenile of the Amargospinus species. Repaint: no. This figure, like any of the new Chaos Effect sculpts, would not be repainted for later toy lines either. Overall rating: 7/10. It looks cool and has a fun defensive action, but it’s not much for playability and has some background story flaws. 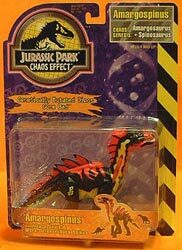 It’s one of the more common Chaos Effect figures, though in territories where this line didn’t get a release that’s not saying much. It’s easy to find on Ebay though, often at relatively low costs.